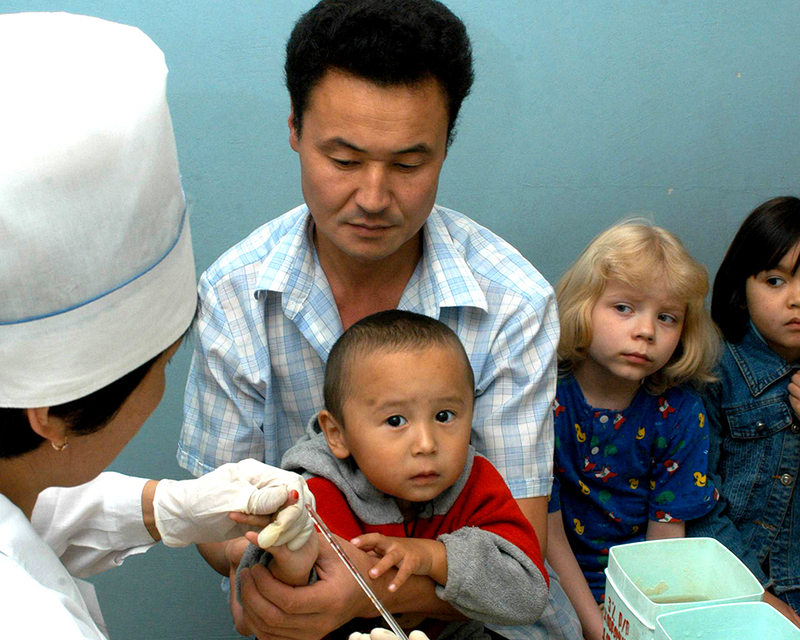 Kazakhstan’s intensive inoculation drive against measles and rubella began in earnest in February 2005 following a measles outbreak that affected around 10,000 people in a six-month period. Those numbers have since collapsed. So news this month from the North Kazakhstan region, a province of a half-million people abutting Russia, of more 100 residents falling ill with measles was cause for alarm. According to regional health officials, half of the patients were under 14 years old. That figure was almost six times higher than anything the province had seen in 15 years. “We have found additional money to spending on buying drugs this year. We are obtaining around 2.5 million doses directly from international organizations,” he said. Last April, Roza Kozhapova, the head of the Health Ministry’s epidemiology monitoring department, said at a press conference that since 2008, more than 13,500 people had refused vaccinations. “There are people who refuse immunization on ethical and religious grounds. All of these groups remain vulnerable to diseases,” Kozhapova said. The number of refuseniks mentioned by Kozhapova for the first four months of 2018 alone – around 500 – suggests the rate is increasing. Sanat, 32, a self-described Salafi Muslim from the western city of Aktau, told Eurasianet that he objects to vaccines because he cannot be certain that they do not contain the cells of proscribed animals, including pigs. “Doctors deny this, but I do not believe them,” said Sanat. Sanat spoke to Eurasianet on condition that his surname not be published, for fear that he might come under investigation from the authorities for propagating what is sometimes termed non-traditional Islam. Madi Akhmetov, the chief imam of Almaty’s Nauryzbaysky district, said that according to the Koran, all Muslims are obliged, in deference to Allah and the people around them, to protect their health. "Every person living in a community is responsible not only for themselves but also for the rest of society,” he said, adding that these views aligned with those of the Spiritual Administration of Muslims of Kazakhstan. Irina Avdeeva, a 34-year-old Almaty resident, cited high-profile, historic cases of complications arising from tuberculosis inoculations as an explanation for her decision not to have her two sons vaccinated. “When the time came for us to get shots, our local doctors did not even explain what this drug was, who had made it, not to speak of what side effects it might have,” Avdeeva told Eurasianet. Avdeeva also said she is distrustful of the authorities, who she suspects are falling back on low-quality medicine. “Our officials are sourcing expensive, good-quality vaccines and taking care of our children? Oh please!” she said with skeptical exasperation. “Kazakhstan always imports properly licensed products. After all, this is for our children. They cannot just take the first thing they find,” Tkachenko said. In September, Birtanov, the health minister, said that a draft bill envisions fining people who refuse vaccination; it would also charge people who succumb to potentially avoidable infections for their treatment. But any such ideas invariably go to the wall. In February, a representative from Birtanov’s own ministry, Aizhan Yesmagambetova, assured reporters that no fines or charges were in the pipeline. “As far as paid treatment goes, we have Article 29 in the Constitution, where it explicitly states that every citizen has the right to guaranteed free medical care,” Yesmagambetova was quoted as saying by Tengri News. If Alyona Sokolova, a teacher at an Almaty secondary school, had her way, all children would be vaccinated as a matter of course. “Whatever beliefs a person might have, one should not deprive a child of the right to health,” she said.